10xLogisticsExperts, LLC - Leading Revolutionary Change: Is The "Final 3 Feet" The Most Important Logistics Leg? Is The "Final 3 Feet" The Most Important Logistics Leg? I have talked a lot about "Final Mile" logistics especially since so many are trying to compete in this area. From next day delivery to same day delivery to "crowd sourcing" delivery just about every retailer is trying to get an advantage over the other through a more efficient final mile delivery network. However, 90% of shopping is still done in retail stores and the final 3 feet are the most important part of the execution of in store logistics. Most logisticians are experts at lean and in plant logistics - getting parts and components efficiently to the assembly line to ensure a very lean and efficient manufacturing process. 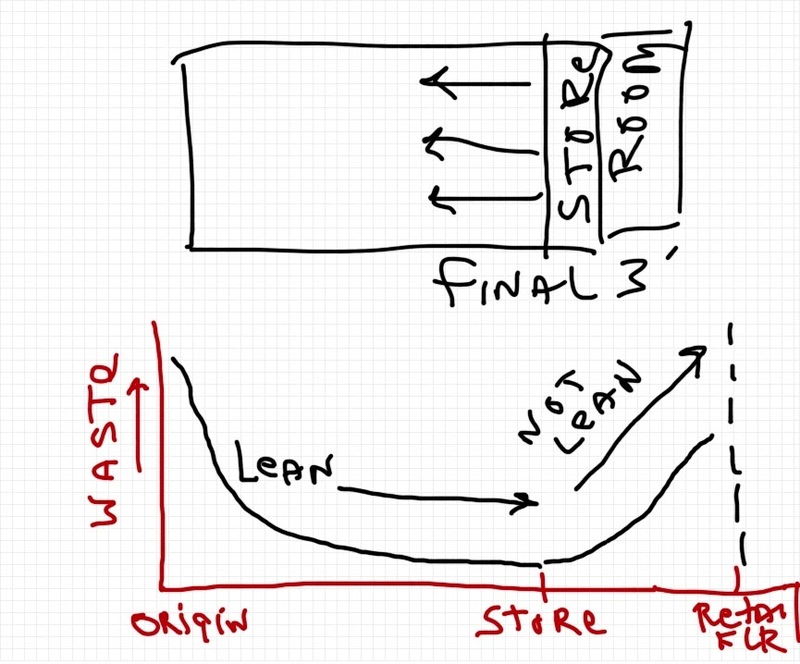 But how many apply the same kind of rigor to the final 3 feet - getting product from the store room to the actual retail floor. After all, if the product is not on the shelves it will be tough for people to buy the item they need. In an article titled "Walmart Customers Say Shelves Are Empty" the Business Insider describes what appears to be a growing problem in Walmarts - product stacking up in back store rooms and no real system or staff to get it to shelves. A tightly wound supply chain gets it to the 3 yard line but cannot bring it into the end zone. Much like Disney where you never see anyone empty trash, yet it is always empty, you should figure out how to restock shelves out of the view of the customer. Have a detailed planograph for every store shelf / floor spot, have a method to measure fill rate at that point and have a detailed plan to restock. Start every day with 100% fill at the shelf level. You will have a running start in keeping the day going well. Sorry for the quality but I needed to do this fast so I drew it with my finger as I could not find my stylus. 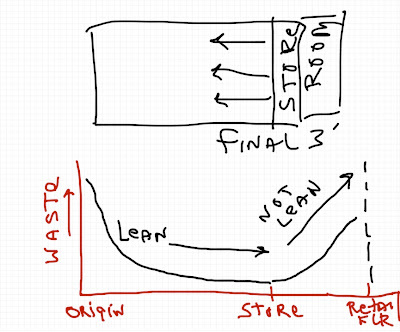 What the graph on the bottom shows is the level of "lean" at each stage of the supply chain from raw material extraction through conversion to the store (store room) then to the retail floor. 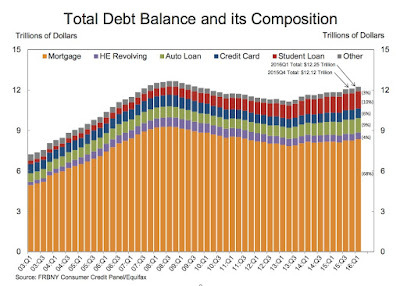 It is your typical bathtub effect. We lean the heck out of the process through conversion and in distribution but then this article claims the final 3 feet is full of waste and piled up product. 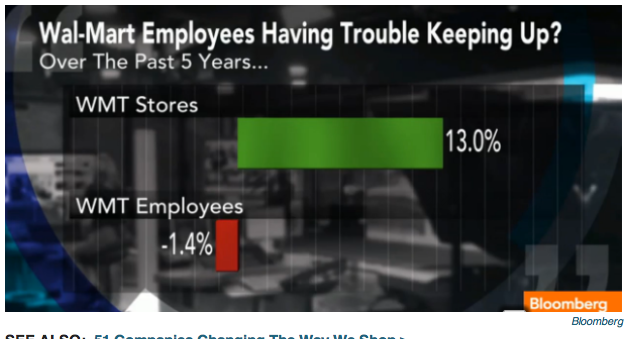 This article blames it on staffing levels and I do not know enough about the staffing levels at Walmart to either support or deny that hypothesis (although the graph below makes a compelling case) I do believe the need to concentrate and develop a solid in store logistics plan is necessary for all retailers. No sense in having an incredibly lean supply chain if the product never makes it to the location where a customer can actually buy it.